We are currently in the middle of celebrating handstand challenge in the month of May. The challenge is simple, perform a set number of handstands per week and post your progress on social media. Sounds easy, right? Well, some may argue that getting upside down is not that easy. It is challenging and sometimes frightening to get your legs over your head. The first thing you may think is that you'll fall over. Realize that your concerns are legitimate, yet it is possible to change your perspective about getting upside down with practice. It is important to realize that when you see someone in a handstand in class or on Intsagram, it wasn't the first time he or she tried. Just like most good things in life, practice is the key to finding your path. You, too, can get upside down. 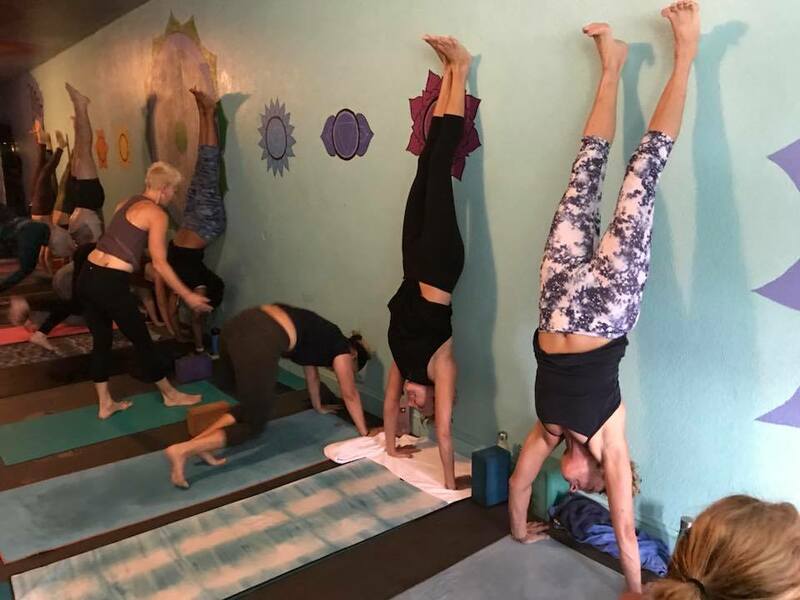 Warrior is offering a number of opportunities to practice handstands all month with a number of handstand clinics and during most flow classes. The opportunity is there for you, so please take it. You'll realize the world is much different when you're upside down. Shift happens when you are willing to go out of your comfort zone and are willing to challenge yourself. Shift is often subtle, but it is exhilarating. Remember when you were a child, and you wanted to climb that big tree in your yard? You may have imagined how beautiful it would be to see the world up in those majestic branches. You may remember being a bit frightened at first, and you probably took small steps to reaching the first low lying branch. Then as you grew in confidence and curiosity, you climbed higher. And once you climbed high enough, you could see the world so much differently from up there. You could see farther, and your other senses felt just a little different too. Think of the handstand challenge as a mirror of this experience. Your confidence will build once you take upon the challenge. When you exercise your bravery muscles, you will witness new revelations about yourself. There are many benefits to getting upside down in a handstand. Handstands energize the body by sending blood to our brains, they reverse the effects of gravity by decompressing the spine, they build upper body strength, and most of all, handstands build confidence. Our instructors at warrior are happy to assist you into handstand, and remember that one small step toward getting upside down is the start to a new perspective.